First of all, this is my first blog post in almost exactly four months. I’ll write another post on why that is and what happened, but for now you can sum it up to in a hurry to make money. This is a sin and the fastest way to lose money in the market, I have been told and now realize. But for now I just want to get back on track with posting. My format will be a little different. For a while now I’ve been doing this analysis and making it available to our paid chat group, along with alerts during the day. For now, I want to have some documentation of my analysis. Dudes and dudettes, thanks for your patience while I’ve regrettably been out (and missed a great day of trading). $SPY freaking killed today. What was amazing to me is how accurately options predicted the NFLX move between the IV and 1 standard deviation. NFLX maxed it out and bounced hard, sending the whole tech sector for a bounce and pushing some to new highs like FB. There’s a lot of momentum there that should carry into tomorrow. Here’s the the thing we’ve seen on all stocks including SPY when they break a major resistance area like 280 is for $SPY: Usually there’s a pullback to test the now support area, so fully expecting a test of 280.05 at some point tomorrow. That would make batman‘s puts valid but determinate on how $SPY acts on the pull back. 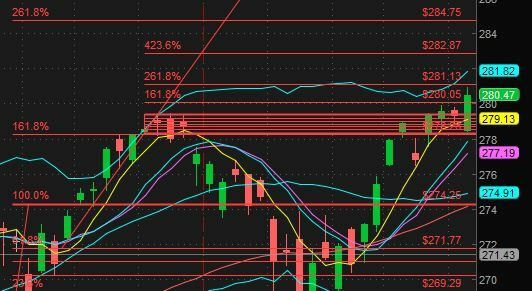 $SPY did prove us all very wrong on this several days ago when it crossed 273.75, however, and just continued making monster moves. I think it’s going to depend on other ERs this week. Oh, and there’s that pesky trade war that apparently is on hold because of NATO meetings PTL. So key areas are 279.16, 279.39, 280.05*, 280.40, 281.05, 280.71*, 281.13, 281.75, 282.87*. ALL moving averages including middle bollinger bands are pointing up, RSI and MACD curled up, DMI is very bullish. And the bollinger bands are leaving us another $1.5 room before $SPY starts walking it, so unless the test of 280 breaks tomorrow going to continue to see nice moves. Continuing to watch $HD and $FB as $HD about to break cup and handle.